mosaic monday 20th oct, originally uploaded by gilfling. More beautiful images from flickr. 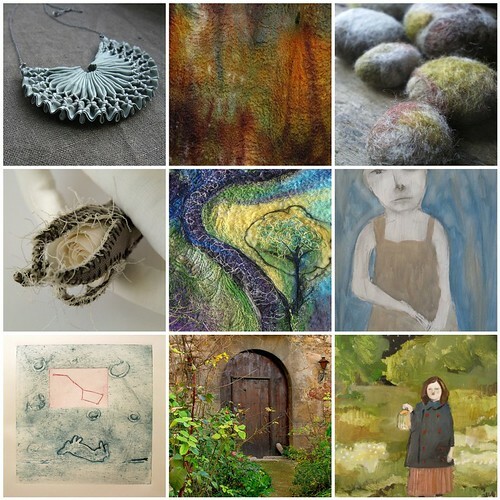 Thanks again to all the artists, artisans and photographers for sharing their work. I am slacking a bit on blog posts at the moment - I know!! So, so busy with various things, mostly work (which is really 'play' too of course) not to mention a very painful trapped nerve in my neck last week which held up creating. So many craft fairs coming up between now and christmas and after a very successful craft fair at the weekend just gone I will have a frantic period of making until the next one on 1st November - just less than 2 weeks away (eep!). I shall try and upload some in progress shots in the meantime. Hoping you are all well and happy! PS Do you have the links to the various pics? I'd love to follow a few of them up.